HI, I'm Nao. I work in the financial industry as a webmaster in Tokyo. I like travel, not only abroad, also travel in Japan. I especially like Kamakura. I would like to introduce the real Kamakura, which has many historic temples and shrines, history about Samurai, and great nature. 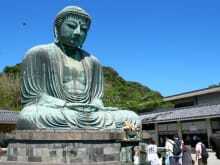 I would like to make your travel in Kamakura much more memorable. We did not go to Kamakura Walk as we did not feel comfortable to take public transportation from our hotel in Narita to Kamakura Station. plus we were worried that there was not enough time. We communicated with Nao. He is a good host. He gave us some alternative itinerary and even sent us a pic from Kamakura. I am pleased with your service. Hope to be back and use it again.